Today I’ll treat you to a photo update. There are various and assorted things going on at the ranch. The painters are cranking away despite me getting them in trouble. They just don’t talk to me anymore. We bought out first LED bulb for the house. It’ll go in a table lamp in the Family Room. $30 at Lowes. A bit pricey but I’ll write it off as an experiment. (no, I’m not literally writing it off like a tax thing or anything). Elsewhere art is starting to hang, mantles are cracking and I even built a shelf. I’m also enjoying my Garden Weasel, though some rain would be awesome. Mother nature washed away all our seed, then whatever seed was left over sprouted and is now dying at the hands of a drought. It’s rained once since the lawn went in. Our cistern water system lacks the water pressure to sprinkle the lawn much. By the way, speaking of art, check out these two guys and their great art. Edward Park paints fantastic landscapes. Paul Fletcher’s encaustic paintings have to be seen to be believed; they’re made from bees wax. We’re fortunate to have original pieces in our new home. Finally I saw the most awesome medium sized turtle in the backyard the other day, while I was watering the hazelnut trees. I’m amazed by how many cool animals call our land home. Turtle chillin’ in our back yard. He (or she) is wet cause I sprayed him with the hose. He looked hot. I’m really helpful. Specs on the LED bulb we got. 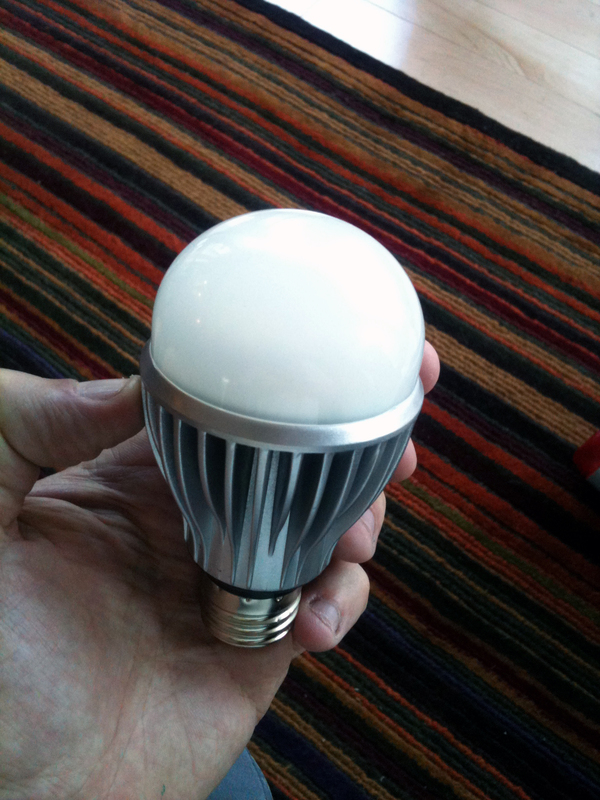 Our first LED bulb. Eat your heart out Greenville Mike! Bonus points now the kids don’t have to stick their hands into empty sockets. Win win. Iso toilet paper holder. I drilled holes all over the place before I found solid wood. Crazy guy with garden weasel alert. Nice white socks. Sorry ladies, I’m taken. Look I made a shelf! Still waiting on cabinet door fronts. We now have “grown up” art in the new house. We probably need to start cleaning the house and stop playing XBox 360. This painting is by Edward Park. Cherry mantle finally cracked in two places. Thank you card is from mom. Encaustic bird art courtesy of Paul Fletcher. Sealskin color on all the board and batten siding, carries over into front door alcove to give appearance that center of house is assembled as one building block. Main house color scheme starts to take shape. This entry was posted in Acts of God, Cool Stuff, Electrical, Land, Landscaping, Living There, Painting and tagged interior decorating, landscape, lighting, Mother Nature Hates Me, painting, sustainability by Chris. Bookmark the permalink.